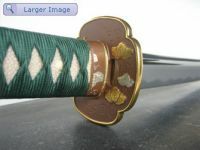 A rather short katana with a wide blade and a double hi, especially designed for cutting exercises. 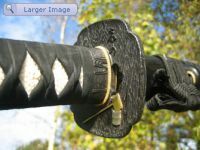 A rather unusual style for a katana. 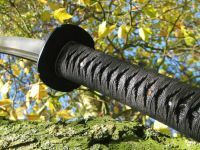 The Hira Zukuri style is most often used on a tanto or wakizashi but we decided to give it a try and Zhui Feng didn't dissapointed at all. 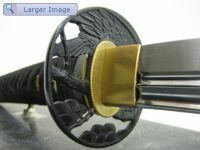 This brown themed katana is a great 'step up' if you like to switch your current iaito for a shinken. 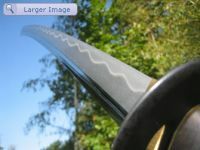 A nice 'dark' katana featuring a T10 steel blade with a Kaki Toshi nakago to reduce the weight and a sliver plated habaki & seppa. 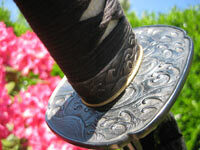 This Raptor Serie katana is forged in the Moro Ha Zukuri style aslo known as the dubbele edged blade. 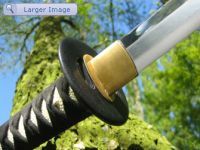 If you are looking to expand your collection or you need a straight bladed katana, you just found it. 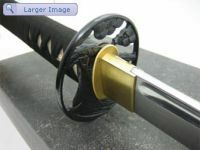 A nice entry level katana for a sword collector or a backyard practitioner, not really something for a Martial Artist. 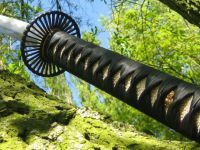 This Practical Pro katana might by the ideal solution if you are looking for an affordable, robust katana. 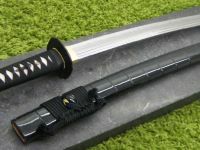 This Practical Plus XL light was designed by Paul Chen and it's special blade geometry makes it an ideal cutting katana. 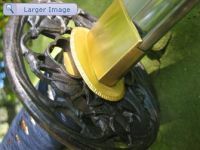 If you're looking for your first 'official' cutter, this Practical XL light might be a home run. 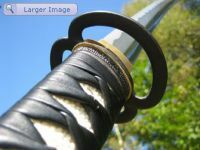 The Miyamoto Musashi katana, named after Miyamoto Musashi ,arguably the most famous swordmaster in Japanese history. 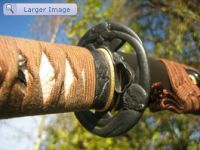 If you are looking for a Katana that fits your needs in order to practise your kata, the Shinto might be an opton for you. 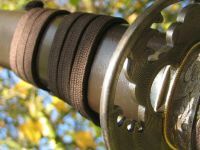 If you are looking for a higher level katana with descent fittings and suitable for Tameshigiri, you just found it ! 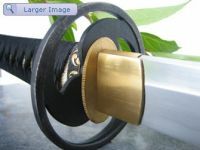 If the standard models are not really suitable for your needs, we have the Big wave katana here, a very robust cutter. 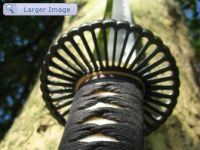 For those in need of a sword for rigorous tameshigiri, and even heavier cutting than the Tsunami is capable of, this is the sword to choose. Best customer service ever!Will purchase again any time soon. 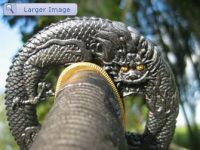 The perfect seller!! 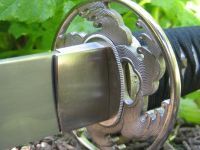 Good communication, speedy delivery, wonderful item! Highly recommended! Thanks and till next time! 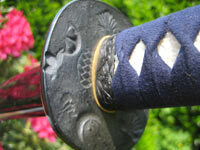 Here under you can find our entire selection of High carbon steel (mono steel) swords. 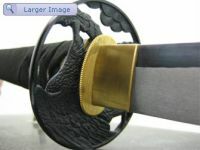 We offer different brands and each of them are forging good quality katanas. 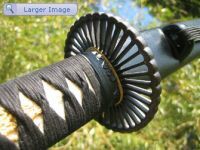 Just remember you get what you pay for, if you care about a good polished and differential hardened blade, the Huanuo katana with the traditional polish is the sword you want to check out.The Paul Chen swords are the most known katana in the “sword world” but actually it all depends on what you expect to do with your shinken. 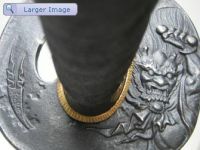 The Huanuo and Zhui feng Swords are good and strong cutters which we tested in several way’s so we know what we are talking about. 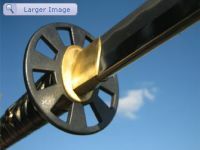 If you are not sure which one to choose, don’t hesitate to contact us ! 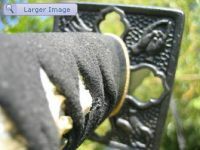 We would be happy to help you out and give you more advice !